The sun has set behind the corporate offices of Washington, DC’s lobbying district, the buildings to our right empty after a long Monday and the sidewalks of Pennsylvania Avenue scattered with young professionals trickling home and a few straggling tourists. In front of us, lights in the curtained rooms of the White House remind us that real people live and work there. We are a group of people talking to another group of people. On this chilly November evening, Abel Núñez, executive director of CARECEN Central American Resource Center, addresses the forty or so people gathered in a circle by the fence of the White House’s backyard. “We have been coming here since July,” he calls into a megaphone. “We came here in t-shirts, with the sun still in the sky. Now it is darker earlier, and colder, but we are here again. And we demand the same things.” A round of applause passes through the small crowd – a diverse group of individuals brought together over the past few months to form a community around the idea of solidarity. Every Monday at 6:30pm, the DC-Maryland-Virginia Coalition for Children Fleeing Violence organizes this vigil, rain or shine. Participants gather outside of St. John’s Church, a historic Episcopal church located a block from the White House’s rear entrance. After about a half-hour of testimonials, speeches, and songs, the entire group migrates through the President’s Park to the gates of the home of what many would say is the most powerful person in the world. 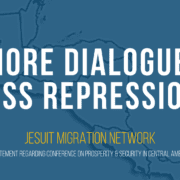 The Coalition is made up of an ever-growing number of organizations and groups committed to advocating for the rights of child migrants to the United States from Central America and was formed in response to the intense media attention that this issue received this summer. Each week, a different member group of the Coalition is in charge of organizing the Monday vigil, which means that each week’s vigil has a different character (but the same rooted purpose). I first heard about the Vigil for Children Fleeing Violence in early September, when Georgetown University’s Center for Social Justice organized the weekly event. I knew very little about the complexities of immigration, but I am passionate about children’s rights and decided to bike the two miles from campus to the White House to participate. After that hour of listening to the brave stories of those personally touched by the child migrant issue, walking as the group sang “This Land Is Your Land,” and joining hands with strangers to raise our voices in solidarity, I knew that I wanted to make the vigil not only part of my weekly routine, but also part of my daily thought and action. Like when the chief medical officer of La Clinica del Pueblo passionately explained how access to healthcare as a basic human right is connected to the plight of detained children without a safety net the week that the clinic hosted the vigil. Or when the Hebrew Immigrant Aid Society organized the vigil the week of Rosh Hoshanah and members spoke of how the notion of “welcoming the stranger” cuts across religious traditions. Or when students from the University of Maryland’s Political Latinos United for Movement and Action in Society (PLUMAS) presented a quilt they had made along with immigrant children and elderly people, hearkening back to intergenerational solidarity quilts used during the AIDS awareness campaigns of the 1980s. Or when individuals from the organization DREAMers Moms USA silently placed candles to form the words “Día 8” for the eight days they had been fasting for their children and for all children affected by violence and migration. Over the past twelve weeks, I have laughed and cried with strangers and with people whom I have come to call friends. The group that gathers is different each week – a shifting bunch of student activists, government and NGO workers, families of immigrants, teachers of immigrant children, politicians, and even the occasional passerby who notices our signs and joins in singing “Ni Una Más Deportación.” Being involved with the vigil this semester has given faces to the debates over immigration in the news and has allowed me to think critically about my own role in perpetuating injustices – but also about the power of individuals speaking up for justice. President Obama’s plan for executive action on immigration reform, announced this November, will directly affect the lives of many of the people who stand with me at the vigil each week. 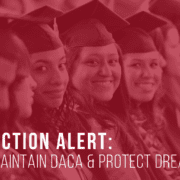 Parents of a U.S. citizen can go about their lives free from constant fear of deportation, and those who qualify for expanded Deferred Action for Childhood Arrivals (DACA), or Dreamer status, can file applications in 90 days. Activists like those at CARECEN are not completely satisfied – the action makes no mention of DREAMers’ parents being protected from deportation, for instance – but they are mostly happy with the direction of the reforms. They continue to send the reminder, however, that the numbers spouted by news anchors and politicians represent actual human lives. For me, a white college student whose only migration story is from small-town Indiana to the city of Washington, DC, the immigration reform discourse could all too easily seem disconnected from my life at Georgetown. What I have learned from the Vigil for Children Fleeing Violence, though, is that I too am affected by the cycles of inequality, poverty, and violence that push and pull people from one place to another. I cannot stand in a circle and sing songs and not feel that my liberation is bound up in that of the people standing there with me, to paraphrase indigenous activist Lilla Watson. Going to the White House every Monday – a fifteen-minute bike ride away from Georgetown’s hilltop campus – reminds me how the university is not isolated from the world outside, as it sometimes can seem. In fact, engaging with others in solidarity is at the core of our university’s Jesuit values. 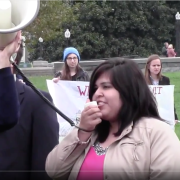 When Hoyas for Immigrant Rights, a Georgetown student group, was in charge of organizing the vigil in October, Fr. Kevin O’Brien, SJ, led the diverse group of attendees in prayer. He reflected on the difference between “accompanying” and “saving,” and how advocacy requires knowing how to listen as well as speak. As we bowed our heads for a moment of silence, I was struck by how noisy that silence was. Indeed, we were not in a quiet place – buses and cars were honking a few blocks away, tourists were posing for pictures, and a different group of protestors were shouting for their cause. And yet, on another level, our silence itself was loud. Our solidarity was loud; it was calling not only to Obama and other politicians in this symbolic house, but also to all members of the human family. Hopey Fink is a senior at Georgetown University studying anthropology and linguistics. Originally from Valparaiso, Indiana, she has always been interested in social justice and cross-cultural understanding. At Georgetown, she is active in the Interfaith Student Association and has worked as a research assistant at the Berkley Center for Religion, Peace, and World Affairs and the World Faiths Development Dialogue, focusing on West Africa. She is also the chair of the Alternative Breaks Program, an involvement that has allowed her to cultivate a passion for engaging a variety of justice issues over her years at Georgetown. Her interests include children’s rights, indigenous rights, and environmental justice; she loves folk music, tea, board games, biking, and little notebooks. She’s excited for the opportunity to hear and share stories as part of the Ignatian Solidarity Network Media Team!